Video clip synopsis – When John Stuart crossed the interior of Australia, he did so in ignorance of the complex set of boundaries and rules for the use of shared resources that existed among the Aboriginal people. Broadband MP4 stuart_bb.mp4 (15.8MB), suitable for iPods and computer downloads. Stuart encounters Outback Aborigines is an excerpt from the film A Wire Through the Heart (55 mins), the third episode of the three-part series entitled Constructing Australia, produced in 2007. When John McDouall Stuart arrived in Adelaide, the British Empire was at its zenith, and young men were flocking to the colonies in search of adventure, fame and fortune. The mother country was six months by sea, and Australia it seemed was six months behind in news and fashion, scientific breakthroughs and new technologies. 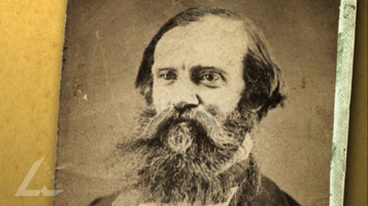 Charles Todd had dreamt of constructing a telegraph line through the heart of the continent and came to see that Stuart was the man, possibly the only man, who could make the hazardous journey to Australia’s northern most shore, and map the route of a telegraph line that would transform the whole country. What is now the Northern Territory has borders that were almost accidental. As the younger colonies of Queensland, South Australia and Western Australia were formed and separated from New South Wales, what became the Northern Territory was the bit left over that no one wanted. Its boundaries gave little heed to geographic regions that might enjoy a natural unity, and none to the existing boundaries of Aboriginal people. About 120 Aboriginal groups had all or most of their land in what is now the Northern Territory, and they recognised a complex set of boundaries and rules for the use of shared resources. When John Stuart crossed the interior of Australia, he did so in ignorance of these boundaries. The Arrernte people of the central desert later spoke of their fear and puzzlement at the Stuart party’s tracks. The Arrernte did not impede Stuart’s journey, but farther north, in June 1860, he was attacked by men of the Warramunga people. The encounter was immortalised in the name given to the dry river where it occurred: Attack Creek. In 1861-62 on his sixth and final expedition inland, and the third attempt to cross the continent, Stuart successfully crossed overland to the northern coast. It was a shocking journey; he suffered from scurvy, stomach ulcers, and became virtually blind from sandy blight (trachoma). Stuart succeeded and survived because he adapted himself to the arid Australian landscape and was able to read signs of water. He realised that he could follow the techniques used by Aboriginal people who had survived in this harsh land for many thousands of years. On large poster paper draw a map of Stuart’s journey from south to north of the Australian continent. Research then note on the map significant places, regions and natural environments, geographic formations and vegetation Stuart and his team passed through, including traditional Indigenous lands. Also note general regional rainfall and temperatures for the time of the year Stuart travelled across the land mass. Imagine you are the grazier James Chambers, employing Stuart to explore the outlying regions of South Australia and beyond. In your own words as Chambers, as though giving a speech to a group of Adelaide politicians to gain support for further exploration of the interior, describe the qualities, knowledge and abilities Stuart has that make him a successful overland explorer in a very difficult and unforgiving environment, and why they should back him financially. From the video clip and from any further research, discuss in class and then write your own report about the colonial attitudes expressed in the South Australian parliament and by the newspapers towards the Aboriginal populations of the interior, after Stuart reported he had been attacked by a party of Waramungu warriors. Why do you think these attitudes were held and do you think that at the time they were understandable? The actor Cyril Japaljarri Dixon, who plays a Waramungu warrior at Attack Creek, says that Stuart and his party had been travelling unannounced for months through tribal land, using up resources. Finally the Waramungu responded to what they saw as an insult. Discuss in class and explain what you think Dixon means by his statement. In groups or as an entire class, research and prepare a presentation about the history of the Waramungu people from first contact with Europeans through to the present, showing the effect on them of European expansion into the country’s interior. This may be done as a scripted oral documentary project which may be made up of different segments, such as ‘mock’ interviews, reports, extracts from historical sources, and the use of sound effects, European and Indigenous music, recorded and edited for radio (or for your school’s intranet).